TECNOBENNE® Srl is a company specialized in the design and manufacture of hydraulic and electro-hydraulic equipment for lifting and handling materials such as soil, timber and both paper and iron scrap. 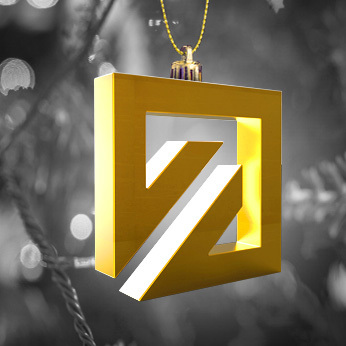 Founded in 2001, the company has a staff with decades of experience, expert designers and welders masters who are able to realize in a short time standard, special or custom-made equipment. Quality product and quick delivery, together with a high standard of liability and safety are a must. We use only materials certified in origin in application of the Machinery Directive 2006/42 / EC Directive. Primary objective is also high professionalism in trade relations. Our company offers a qualified service, continuous availability of spare parts, a commitment aimed at customer satisfaction. 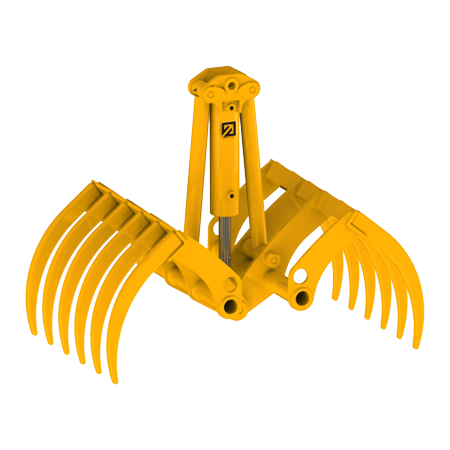 Gripping equipment with 3, 4, 5, 6 tines with independent and synchronized movement, each of which is driven by an oleodynamic cylinder. Gripping equipment with two clamshells with synchronized movement, driven by an hydraulic cylinder. Gripping equipment with 2 arms with synchronized movement, driven by an oleodynamic cylinder. 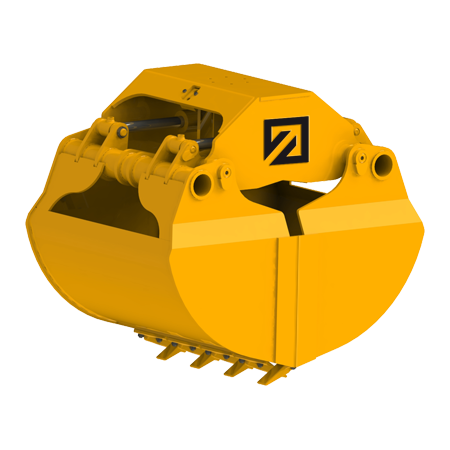 Gripping equipment consisting of 2 valves in synchronized movement, actuated by one or more hydraulic cylinders. 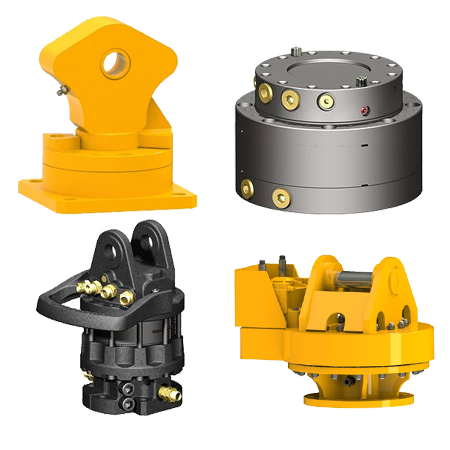 Rotators, suspension link and accessories for hydraulic equipment. 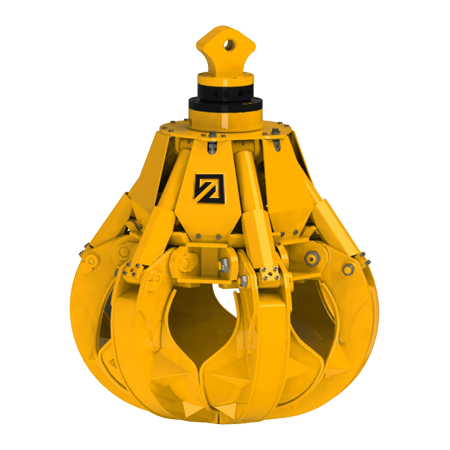 Hydraulic polyp-grabs for excavators and mini-excavators are equipment for various materials handling, available with standard tine (A), thin (B) or high coverage (C). The first one is more requested, because is perfect to fit almost all uses, the second one is used for voluminous materials, while the last model, with high coverage, is perfect for very small or pulverized material. 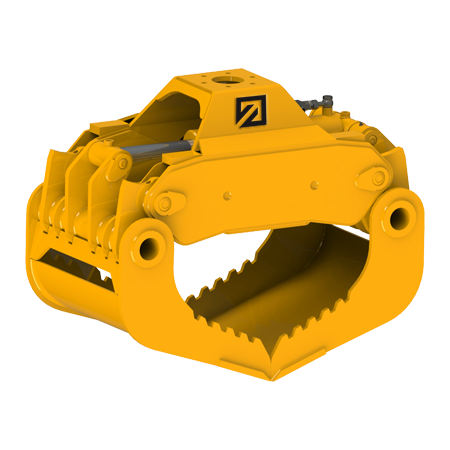 Hydraulic log grabs for excavators and small excavators are equipment for material’s handling.Usually wheels or crawler excavators work with a pressure higher than 250 bar, our log grabs work at 200/250 bar depending on the model. So if the excavator doesn’t have it already, it is high recommended to have a max valve on the excavator’s arm to regulate oil pressure for a good use of the log grab.